Haven’t decided on a hotel yet? You can look at other available hotels in the Castilla y León region with Booking.com. 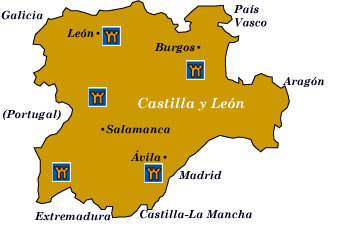 The largest region or autonomous community of Spain, Castilla y León were once former rival medieval kingdoms until unified in 1037. Its vast, arid plateau, known as the meseta, is punctuated by thousands of castles, proud remnants from a long history of constant battles between Christians and Moors. It’s not hard to see how the name Castilla, or “castle” was given to the region. Traveling through this austere region reveals the heart of Spanish culture: the simple yet elegant Romanesque churches and monasteries devoted to millions of medieval pilgrims who followed the Way of St. James to Santiago de Compostela; the charming towns lined with the emblazoned noble mansions that once belonged to the Spanish aristocracy; glorious Gothic cathedrals; honey-colored Renaissance monuments, and proud villages that have scarcely changed in centuries. Salamanca Every Spanish language student in the world knows of Salamanca’s charms. With a famed and lively university scene (its university was founded in 1218), the town is equally known for the stunning Renaissance and Plateresque architecture found in its golden sandstone buildings. Its Plaza Mayor is considered one of Europe’s finest open squares. The photogenic former palace called the Casa de las Conchas (House of Shells) and Catedral Nueva and Catedral Vieja (new and old cathedrals) are the must-see sights. León Founded in the first century by Romans anxious to guard their gold mines to the west, León is a charming city filled with open squares, pedestrian-only streets, tapas bars, and great monuments. León’s Gothic cathedral is a wonderland of stained glass and light, while the façade of the Real Basílica de San Isidoro is a treasure of the Romanesque style. Even if you don’t stay at the Parador de León, more commonly known as the Hostal de San Marcos, its Plateresque façade and accompanying cloister are among León’s grandest sights. Burgos Traditionally one of the most conservative of Spain’s major cities, Burgos’s soaring and magnificent Gothic cathedral is a UNESCO World Heritage Site as well as the burial place of the historical and sometimes mythical El Cid. Wealth from the wool trade brought great art and architecture as evidenced in its churches, monasteries, and noble mansions. With a compact atmospheric city center and lovely riverside promenade, Burgos is well worthy of a visit. Segovia Spectacularly situated on a rocky spur that is often compared to a large ship, Segovia hosts a number of architectural landmarks. Featured on countless posters promoting Spanish tourism, the Alcázar is the quintessential castle, complete with towers, turrets, and moat. Even though the original castle burned down, this reconstructed marvel can satisfy the most finicky castle aficionado. The other most recognized symbol of Segovia is its aqueduct, a masterpiece of Roman engineering that was in use until the late 19th century. Segovia is now a UNESCO World Heritage Site. Ávila Few cities in the world attract visitors with their walls, but Ávila is one that does. It is encircled by a magnificent 11th-century wall that is reinforced with dozens of towers and thousands of merlons. When the sun shines, the stones of the wall glows in golden tones. Ávila is also the birthplace (1515) and spiritual center of the mystic Santa Teresa, and convents, churches, and streets throughout the town are devoted to her. Ávila is close enough to Madrid to be considered a day trip, and its altitude of 1130 meters (3700 feet) makes it a pleasant place to escape the heat during the summer months. Magnificent castles Some 2000 castles define the Castilian landscape, ranging from purely defensive structures to noble residences built by knights whose services were no longer needed at the completion of the Reconquest in 1492. At that time Queen Isabella and King Fernando forbade the further building of new castles so no one could challenge their power. Among the most stunning castles of the region to visit are Coca, La Mota, Peñafiel, Castillo de Frías, Castillo de Cuéllar, and the Castillo de Valencia de Don Juan. Charming villages Castilla y León may attract visitors with its grand monumental cities, but its delightful smaller towns and villages can hold their own with charm and personality. Considered among the most beautiful towns in Spain are: Pedraza de la Sierra—one of Spain’s best preserved medieval towns, aristocratic mansions line the ancient cobblestone streets, while an austere castle rises above; La Alberca—a restored mountain village in the Sierra de Francia with cobbled streets and stone and half-timbered houses; Covarrubia—named after its nearby red toned caves, medieval walls enclose the old town center with its arcaded half-timbered houses; and Castrillo de los Polvazares—in the northwest part of Castilla y León and just west of Astorga, is the Maragatería, home of the Maragatos who were thought to be descendants of the North African Berbers, Celts, or even Phoenicians and who were the traditional muleteers of Spain. The architecture of this bright and charming village is representative of their unique way of life.